Innovation rules as you utilize all materials you can access to design and build the world’s most exciting roller coaster. This interactive business simulation encourages participants to work together within their small teams, as well as within the larger ‘theme park.’ Each small design team of 5 to 10 people works in their ‘theme park’ area that is located near the working areas of the other teams. Project managers that you elect oversee the project and uncover your theme park customers’ needs. Place the right mix of thrills and chills without sending any of your customers off the track. Decide whether you’re going to start the ride with kinetic energy or a flywheel launch. And if you’d like, your ‘marketing department’ can present a fun commercial for your ultimate roller coaster before the final moment of truth. Your roller coaster has a minimum marble time requirement to meet and you will be able to deliver multiple marble rides to examine best practices and process improvement. A diversity of roles means a chance for everyone to be included. Time is limited – can you drive innovation, communicate effectively and meet your goals to become roller coaster tycoons? 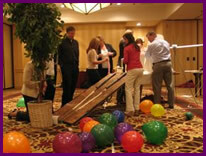 Innovation rules in this performance-based charitable team building event! The better you do, the more local charity ‘customers’ benefit. And regardless of how your team does, a curriculum and roller coaster building kit is donated to a local school so your efforts benefit not just one but two different groups! Become true new millennium roller tycoons – by giving back where it’s most needed. Perfect for the team getting together that usually works virtually (any group which must work together to accomplish goals without close physical proximity or whose main means of communication is electronic). Each small design team of 5 to 10 people works in their ‘theme park’ area that is located in remote areas in the same building and then brings their section together for the finale. Communication is especially important here, because the different pieces must sync up without anyone having seen any of the other parts! This program includes a debrief by a trained facilitator around team effectiveness, innovation, communication, seeing the big picture, and time and resource management. The debrief can be customized for your group goals. 20-500 people. Groups over 50 build multiple roller coasters.